Happy November, friends! Today I am kicking off the annual National Blog Posting Month (NaBloPoMo)! NaBloPoMo stands for “National Blog Posting Month.” The goal of NaBloPoMo is for participants to write a post a day for an entire month. Although November is the biggest month for NaBloPoMo (with prizes and everything!) people are invited to take up the challenge of writing a post a day during any month. To help inspire bloggers, NaBloPoMo assigns a theme for each month, and also offers daily writing prompts, but these are optional. Bloggers are not required to write on a specific month’s theme or a specific day’s writing prompt. Any post about anything at all counts. I always love participating in this because it’s a great way to get back on track with blogging if I’ve been slacking for awhile. 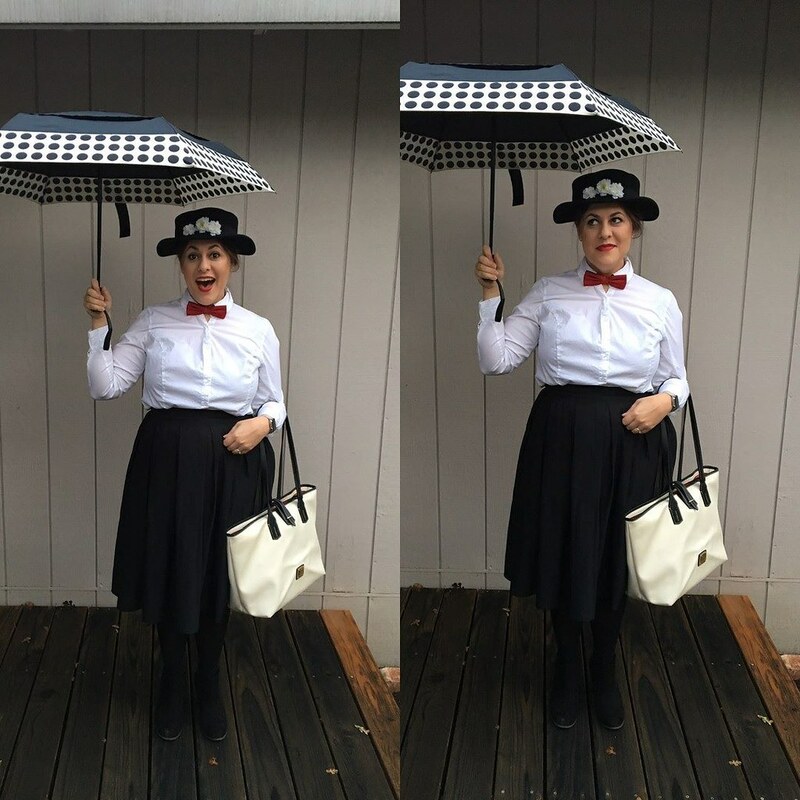 This year I dressed up as Mary Poppins. Originally I was going to do this last year, but I didn’t get everything for my costume in time. This year all I needed was the hat and a new umbrella to complete my ensemble, and I was ready to go! I had a skirt from a thrift store I was going to wear, but my sister had a skirt from Forever 21 that worked even better so I used that instead. Several of us dressed up at work for a mini costume contest. Falon was went as Amélie, Chase was Donkey Kong, Eduard was a guy being held up by a monkey, Tyler was a “Tylersaurus Rex”, Vasile was Luke Skywalker Bird, Jose was Boba Fett, James was a Stormtrooper, and Laurie was Google Maps, which was by far my favorite costume! After work my brother-in-law, Cedar, and sister-in-law, Tiffany, came over for dinner and we watched Harry Potter and the Deathly Hallows: Part 2. I made Crockpot Sweet Potato Turkey Chili and Clean Eating Gluten Free Cornbread and Tiffany brought over Gluten Free Pumpkin Pasties. Since the amount of trick-or-treaters has decreased over the years we turned the lights off as soon as everybody came over. And because of all the rain we’ve been having throughout October I didn’t bother decorating outside this time. Did a little decorating above the fireplace but that was about it. Overall it was a nice, quiet Halloween, and I enjoyed getting to spend time with a couple of my sibling-in-laws before they make the move to Washington by the end of the year. I would try blogging every day for a month but I think I blog regularly as it is. I used to do it in the past but it often felt like a chore towards the end of the month because I was just trying to achieve the goal of blogging every day. It’s definitely good for motivation and encouragement though.